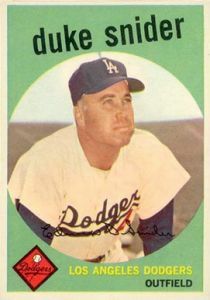 Duke Snider is gone, but he’ll never be forgotten. This is the story of how an article I wrote for LA Dodger Report brought me into contact (in a small way) with the Duke of Flatbush. I am so glad I was able to see guys like Snyder play. These are “Real” Ballplayers, who paved the way for these spoiled millionaires. Majority of these young players don’t even know who the Duke was. 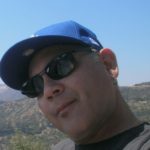 Many on this blog do not realize the significance of these pioneers, and really do not understand what “Real” baseball is. Guys like these played for pride, and for the “TEAM”, because they certainly were not getting paid much money. As a big proponent of restorative justice, big thumbs up to the pardon. As a big opponent of making assumptions, big thumbs down to BlueFan’s “many on this blog…” silliness. Still appreciate your posts, boss. I figured, Bluto…. if you did not like it, you would not read them, and not respond. Thanks. Just fun to put a spin on everything…. makes you wanna’ say, “Hummm?” Just for the sake of arguement. One of my most prized possessions is an autographed photo I have of Duke Snider. He signed it for me at a card show in Anaheim many years ago. I got to talk to him for a few minutes and it was really great. He was my favorite player on the Dodgers and it was heartbreaking when Bavasi sold him to the Mets. It was even worse the next year because the Mets sold him to the Giants. I remember him hitting a homer at Dodger Stadium off of Joe Moeller. Moeller was a graduate of Mira Costa high, where I went to high school. He used to come before he went to Vero and throw batting practice to us. Wes Parker got Duke to also sign an autograph card for me. I will not forget that. Duke is still one of the few to ever hit 40 plus homers 5 years in a row. He drove in over 100 all those years except the last one, 1957 when he only played 130 games. He would have easily driven in 100 again. I just wish that Gil Hodges was in the hall with him. If there is a more deserving player than Gil out there who has not made it in, I am not sure I know who that would be. 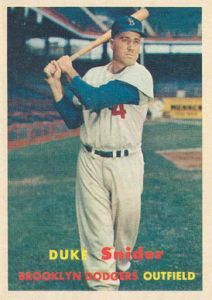 My favorite baseball card of Duke is the 1959 Topps. The 57 is right there with it. Didn’t Duke have a bowling alley over in Whittier? I have been in there I think? Yes he did. He also owned a avocado farm in Fallbrook. I went by there a few times. Just think about this a few minutes. 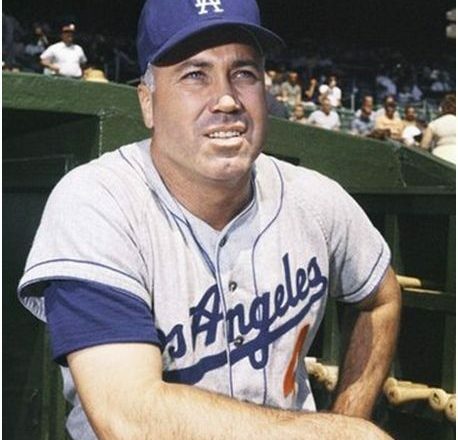 O’Malley chose to have the Dodgers play in the Coliseum instead of Wrigley Field, which was on what is now Martin Luther King boulevard, because of the seating capacity. That’s why for 4 years baseball was played on a field that was better suited for football. Had they played in Wrigley, Duke would not have injured his elbow as he did trying to throw a ball out of the coliseum. He missed by about 20 feet by all accounts. But, the big thing about that is that RF at the coliseum was a long way off. In 1958 although it was 300 feet to the foul pole, it dropped off to 440 feet! Duke hit 15 homers that year, down from 40 the year before. He only hit 6 in the coliseum. I could never figure out that even though a huge scree was put up in LF due to that short distance, they they still would have allowed RF to be that far away, 440 FT. knowing how it would impact the Duke’s offense during that time. They were at that time, 1958, still a RH heavy lineup. Even without Campy. Furillo, Reese, Hodges, all RH hitters. Roseboro took over for Campy. They had Cimoli in LF. Demeter came up and played some games. They had purchased Steve Bilko. Lots of RH power in the lineup……. Friedman was just overheard saying that it was a great accomplishment for the Rams to make it to the Superbowl. Friedman was also just spotted getting punched in the mouth by a Rams’ fan. Now that’s funny right there….the LA curse in action. All the other cities base their streaks on a curse, so why not the Friedman curse? Bridesmaid, never the bride….. I have written previously about my encounter with Duke Snider. Opening day at Dodger Stadium in April 1962. I was 14 years old and it was the first game at Dodger Stadium. I was down by the right field line watching batting practice and Duke was shagging balls in right field. A foul ball was hit down the line right where I was standing. I opened the gate and stepped out to retrieve the ball. I lived in Fallbrook for a few months in the fall of ‘72. I met him at his restaurant there. He was actually behind the bar. It felt like he was only being nice because he had to. Idle, pleasant onversation did not appear to come easy for him. I thought maybe he was just having a bad day, but I heard from others in the area nope, that’s him. I do remember he said Koufax was the greatest pitcher he had ever seen. Career slash line of .295/.380/.540. Only 1247 strikeouts in 8237 plate appearances. You won’t see stats like that again. Did you read Kahn’s The Boys of Summer? I think that explains a lot about why Duke was the way he was. SoCal boy, so he was glad to come home. But he always was a little stand offish to the fans, especially after the interview and story Kahn wrote for his paper about how Duke was only in it for the money and he did not really enjoy the game. He also cared less about what the fans thought. In Brooklyn, that was tantamount to treason. It took him hitting 4 homers in a world series twice to get any amount of forgiveness. By the way, after all these years, he is still the NL career leader in World Series HR’s with 11. Now a days they count all the playoff stats together. But Mantle still leads with 18 in the AL during a WS, and Yogi has the most rings…..10. No modern player is going to come close to those numbers. Duke is still the only player to hit 4 in a series twice. A couple of players have hit 5 in a single series. I read it about 35 years ago. Great read. As I recall Snider was depicted as incredibly talented but surly and aloof. Could be wrong about that. Surly and aloof. That’s also how I remember my first wife and she couldn’t have been that bad or I never would have married her….. right? Mantle played in 65 World Series games. I really doubt anyone will come close to that number again. So it’s Feb. 5 and there is absolutely no buzz whatsoever regarding the Dodgers. Sounds about right, FO can’t be accused of doing anything to strengthen the team, only activities have been to ditch salary, this does not bode well for the upcoming season. Okay, they did get Pollack, but is that really doing something to strengthen the team, maybe a bit but the numerous starting players and pitchers that were unloaded hardly are offset by the acquisition of Pollack. Not really to excited about what lies ahead. And thank you Dodgers for putting the championship hex on the Rams. Keith Law, who I quite like, has the Dodgers #5 overall. IMO this is ludicrously great given how low the Dodgers pick, the limitations on International signings and the trades at mid-season. Now, Harper is still available….